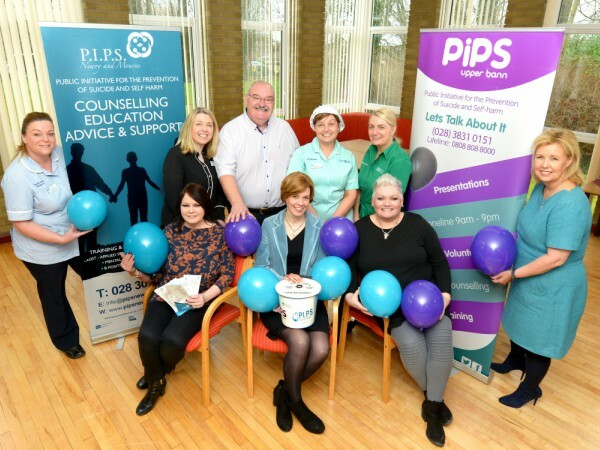 Pictured at the launch of the Trust’s Charity Partners are Thelma Thompson, PIPS Hope and Support; Barbara Scott, PIPS Upper Bann; Vivienne Toal, Director of Human Resources and Organisational Development; Brian Smyth, NIPSA with members of Trust staff. The Southern Health and Social Care Trust launched a new joint partnership with PIPS Upper Bann and PIPS Hope and Support as Charity Partners for 2018-2020. Since 2013, the Trust’s Charity of the Year scheme has raised over £268,000 to support local charities and over the next two years, Trust staff will help raise awareness and vital funds for both PIPS charities. The charities were nominated by staff and chosen by a Selection Panel as the Trust’s new charity partners. Fundraising monies collected will be split equally between both PIPS charities and will be used to provide crisis counselling to support vulnerable people who are at risk of suicide and people who self-harm in the Southern Trust area. Launching the new partnership Southern Trust Director of Human Resources and Organisational Development, Vivienne Toal said: “We are delighted to welcome PIPS Upper Bann and PIPS Hope and Support as the Trust’s Charity Partners. We looking forward to working in partnership with both charities to help promote the work they do and to help raise much needed funds for the provision of their services in the Southern Trust area. “We have over 13,000 staff living and working across Armagh, Dungannon, Craigavon, Banbridge and Newry and Mourne. We know that there are many very worthy causes out there, all trying to raise much needed funds, so the Charity of the Year initiative was set up a few years ago to show how collectively, Trust staff could make a significant contribution to the wellbeing of others.